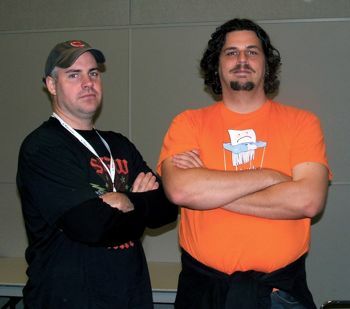 At the recent Podcast and Portable Media Expo, I had a chance to talk with Douglas Sarine (L) and Kent Nichols (R), the guys behind the viral video podcast hit Ask A Ninja. I was suffering from laryngitis at the time – which meant that I spent most of the interview listening. It’s just as well – Douglas and Kent are so quick on their feet, and are hysterically funny. They also have a lot to say about how two guys with no money and a good idea can do something creative and get a worldwide audience. Kent and Douglas talk about the genesis of Ask A Ninja; their new Ninja social network; the evolution of the podcast (while they’ve tweaked certain behind-the-scenes details, the program format has stayed the same throughout); the truth about pirates, clowns, robots and zombies; their “business model”; and their ideas on the future of indie media. And rapper battles. Really. Kent Nichols is a candidate for the Advisory Board of the Association for Downloadable Media, elections for which are currently underway. um… link to the interview? Sorry if it’s not more obvious – but at the end of the article there is a Play Now link, along with a download link.